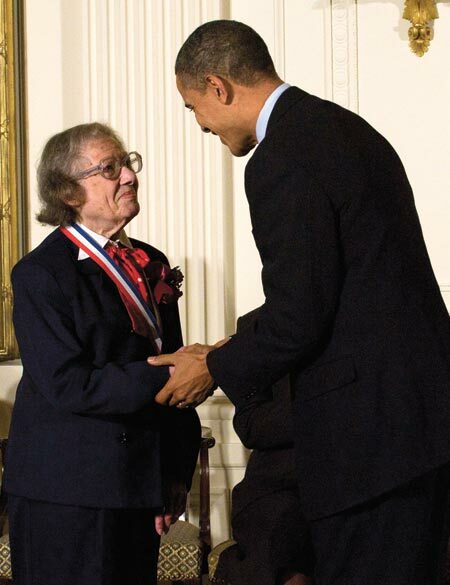 Esther M. Conwell, research professor of chemistry at the University of Rochester and recipient of the National Medal of Science, died in a motor vehicle accident Sunday at the age of 92. A pioneer in the field of semiconductor research that ultimately revolutionized modern computers, Conwell was recognized as one of Discover magazine’s Top 50 Women of Science in 2002 and awarded the National Medal of Science by President Barack Obama in 2010. Her expertise earned her the rare honor of memberships in both the National Academy of Sciences and the National Academy of Engineering. Conwell’s academic and professional careers began at a time when women were rarely seen in science classrooms and laboratories. Early in her career, Conwell was hired as an assistant engineer at Western Electric. Shortly afterwards, she was notified that no such classification existed—for women. So she became instead an engineer’s assistant, a reassignment that significantly lowered her pay. Conwell’s journey started at the University of Rochester as a master’s student in physics in 1942. She completed her master’s thesis under the supervision of Victor Weisskopf. Together, they formulated the Conwell-Weisskopf theory that led to a better understanding of how materials affect the flow of electrons inside transistors and integrated circuits. Initially kept under lock and key as part of the war effort, the work was declassified and published in 1950. After teaching at Brooklyn College, her undergraduate alma mater, and earning her doctorate degree from University of Chicago under the Nobel Laureate Subramanyan Chandrasekhar, Conwell spent most of her life in industry. She worked as an industrial scientist for 47 years at Bell Telephone Laboratories (1951-1952), GTE Laboratories (1952-1972), and Xerox Corporation (1972-1998). Conwell joined the University of Rochester as an adjunct professor in 1990 and then a full-time professor in the Department of Chemistry after her retirement from Xerox in 1998. She worked on the movement of electrons through DNA, publishing prolifically, and mentoring many promising undergraduate students. She was awarded the Dreyfus Senior Faculty Mentor Award in 2004. Conwell was married to the novelist, Abraham Rothberg. She is survived by her son and fellow scientist, Lewis J. Rothberg, professor of chemistry at the University of Rochester, daughter-in-law Shelby Nelson, and two grandchildren. The University flag will be lowered Thursday, November 20th in memory of Esther Conwell.